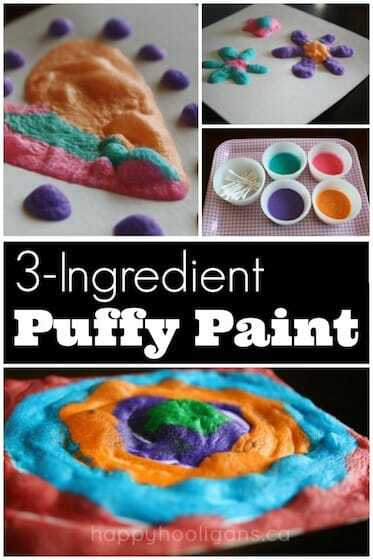 21 Adorable and Easy Halloween Crafts for Kids!. 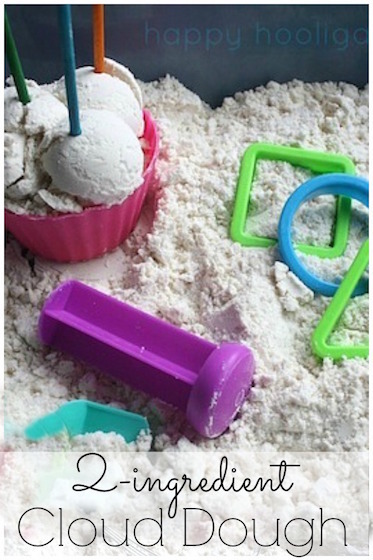 Great for preschool, daycare and homeschool classroom! The days are getting cooler, and the evenings are getting darker. 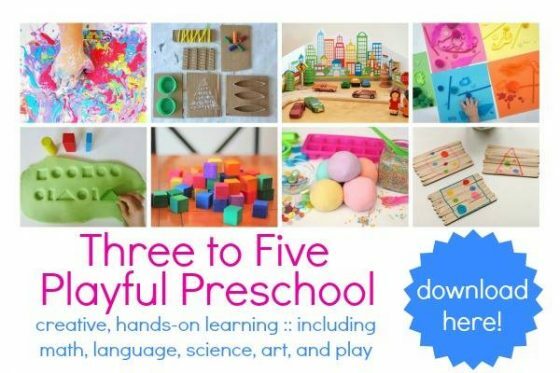 Fall is just around the corner, and if you’re a daycare provider or teacher, you’re probably planning your fall activities and autumn crafts already. 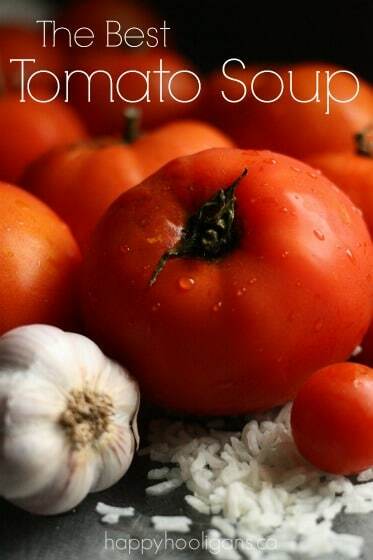 If you’re thinking as far ahead as Halloween, you’re going to love this post! 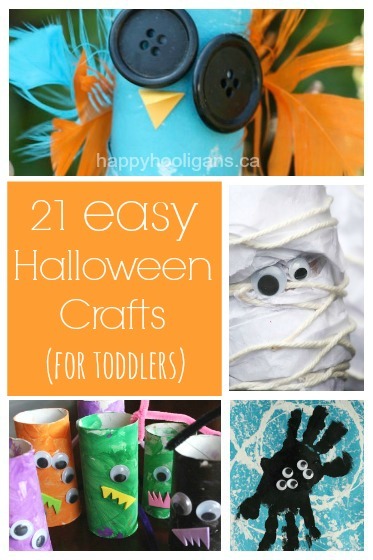 I’ve rounded up 21 of my favourite easy Halloween crafts to make with your toddlers or preschoolers this October. Wow! 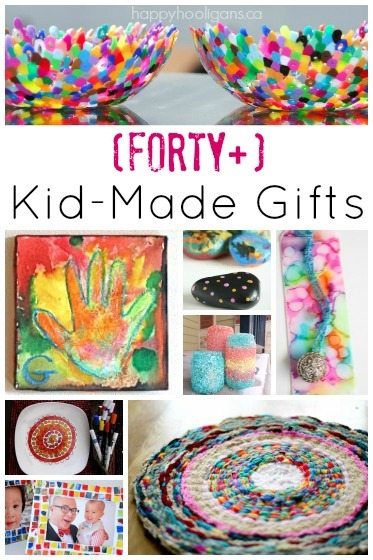 That’s a lot of Halloween craft ideas for kids! These ideas will keep you crafting through the entire month leading up to the spookiest day of the year! The hooligans and I LOVE crafting for Halloween, and we like to keep things simple by using basic craft materials and things you already have around your home. We have lots of ghosts, pumpkins, monsters, mummies and spiders for you to make at home, daycare or in your preschool classroom. 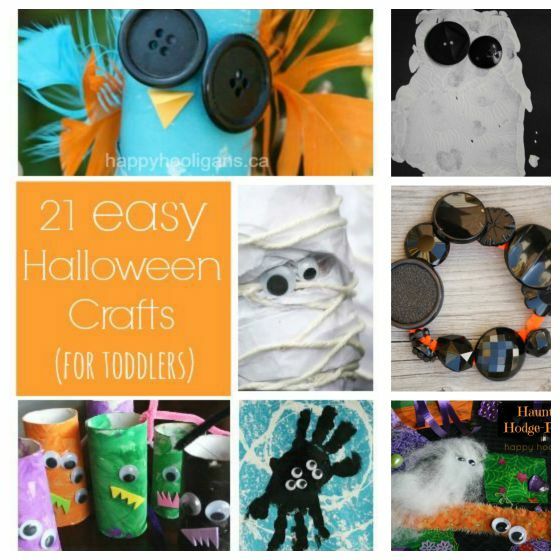 Pin them or bookmark them to refer to when your kids want to get crafty this October. 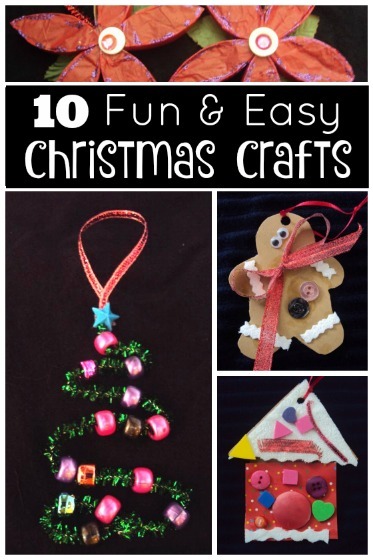 The clickable link in the descriptions of the crafts will take you to the details of each post. 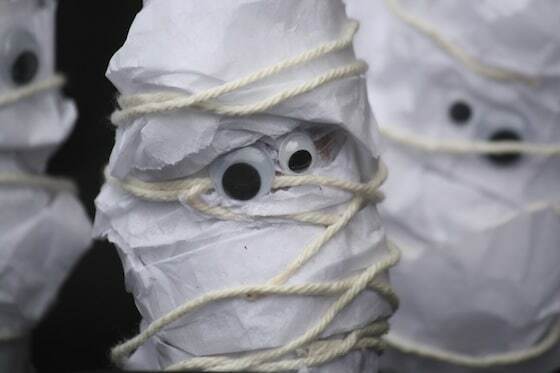 Wrapping and winding skills are challenged when making these adorable tissue paper mummies. 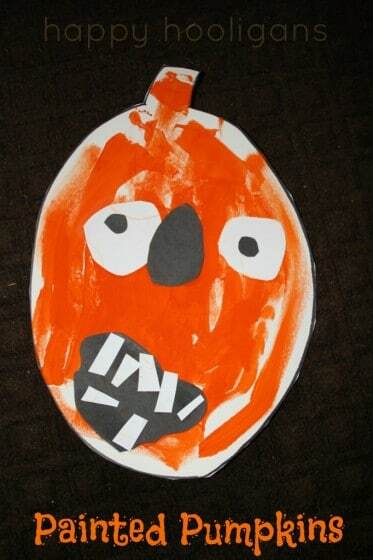 This unique pumpkin art project lets kids get creative with paints, stamps, scissors and glue. 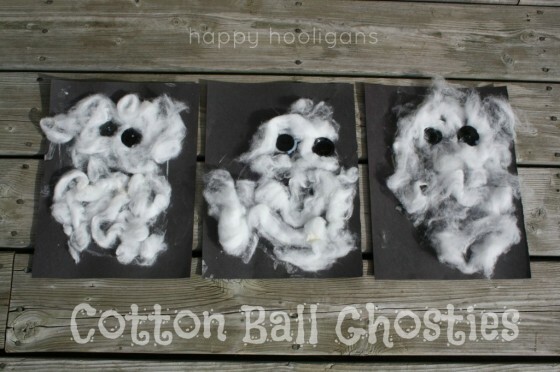 Cotton Ball Ghosties – a tactile craft for toddlers using chalk, cotton balls and buttons. 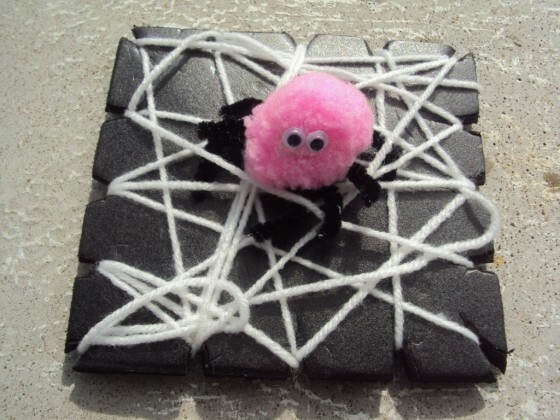 Pom Pom Spiders and Wooly webs are fun for little fingers to practice their weaving skills. Make Monster Hands! 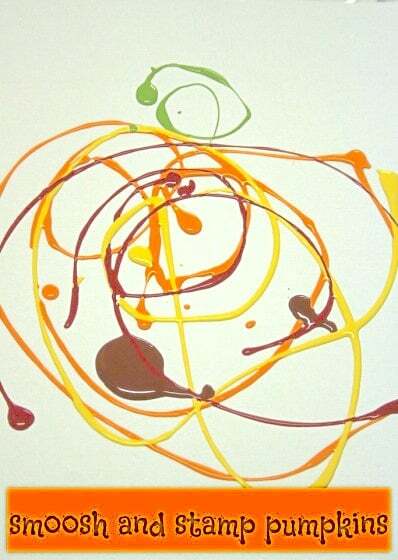 Everyone loves a hand-tracing activity, right? 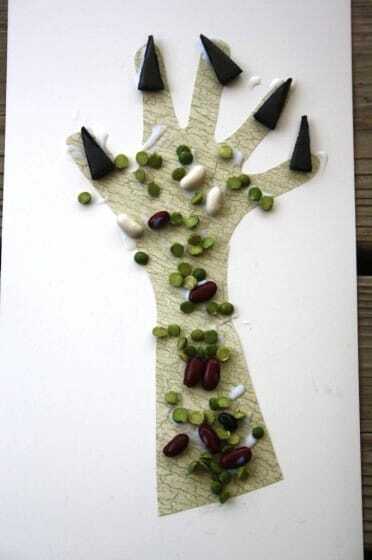 Beans and lentils add some sensory fun to this craft. 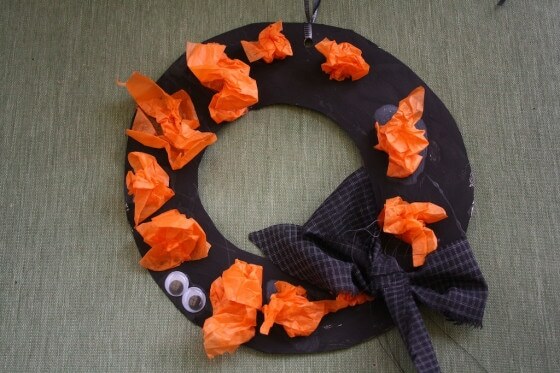 Simple Halloween Wreath. Kids love the crumpling process and googly eyes always put a silly spin on things. 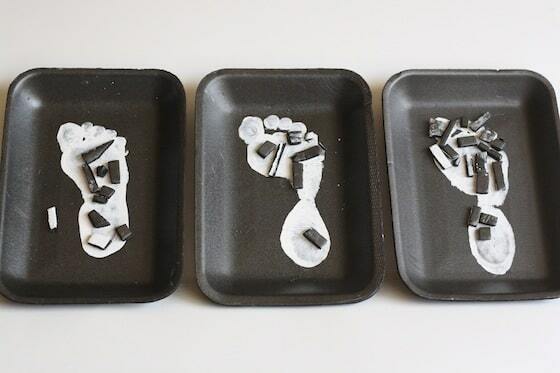 Repurpose styrofoam meat trays into a skeleton footprint craft. 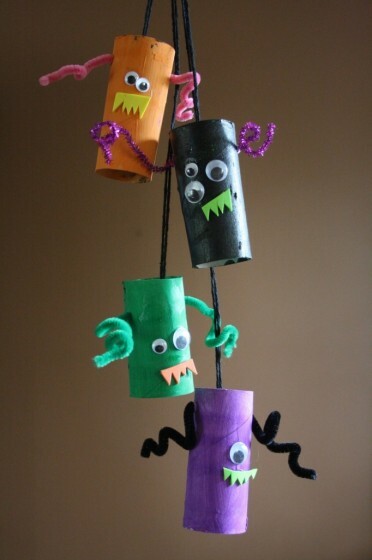 A monster mobile is a whimsical way to upcycle some cardboard toilet rolls. 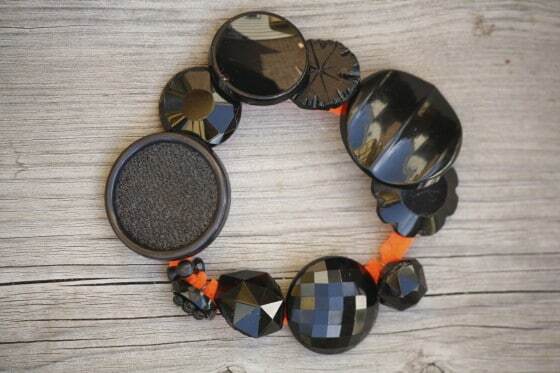 Strengthen fine-motor skills while making a Halloween button bracelet. 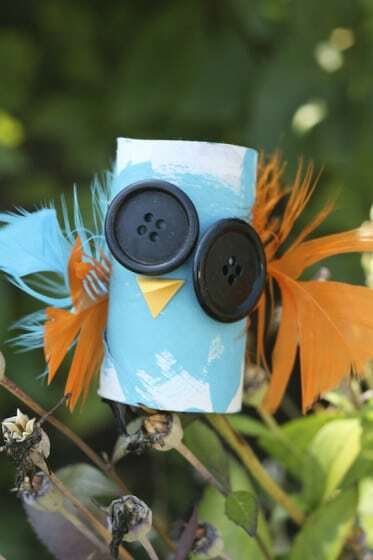 Turn a toilet roll into a spooky Halloween owl or crow. 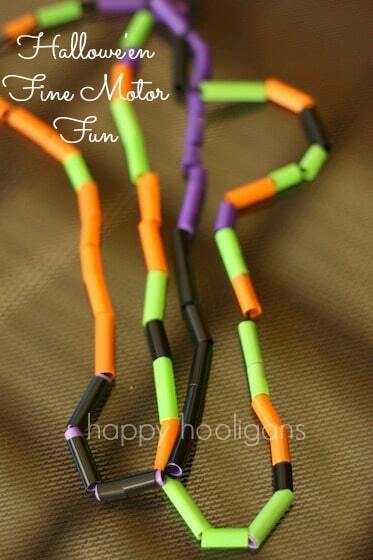 Threading Halloween necklaces is a fun fine-motor activity. Smoosh and stamp some pumpkin art using a plastic bag and this fun paint technique! 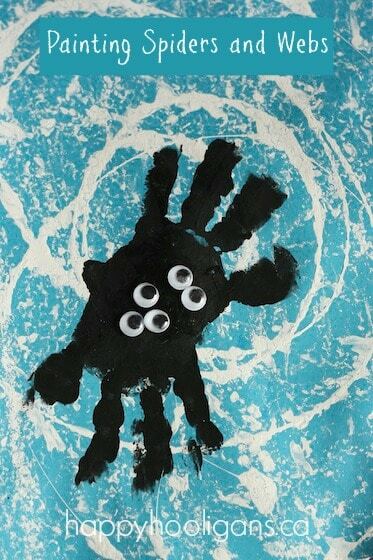 Use an energetic, whole-body painting process to make a web for a hand print spider. 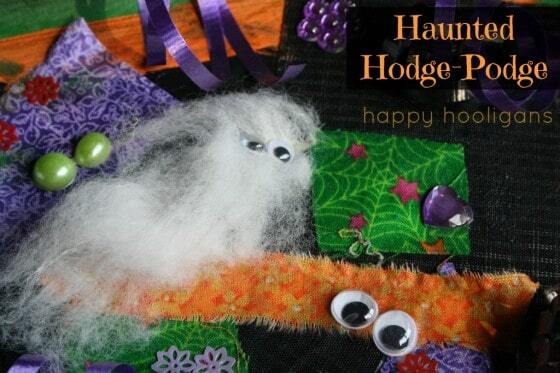 Round up fabric scraps and a few crafting odds and ends, and create a halloween collage. 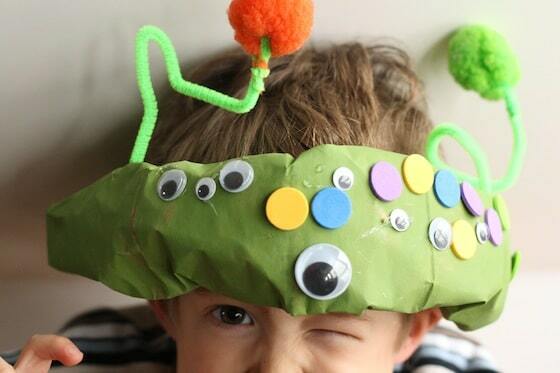 Turn a paper bag into an alien or monster head-piece. 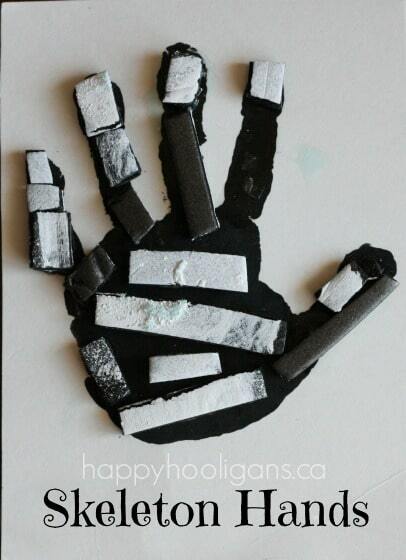 Using meat trays again, create some skeleton hand print art. 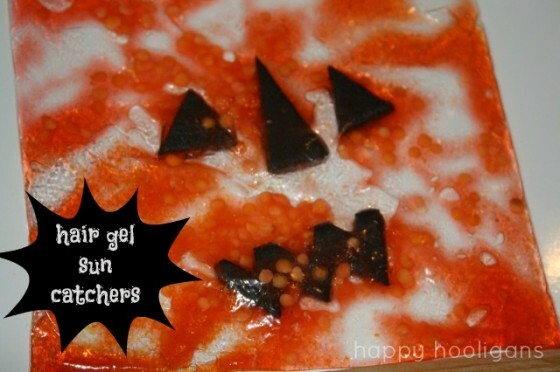 You won’t believe what we used to make these nifty halloween sun catchers! 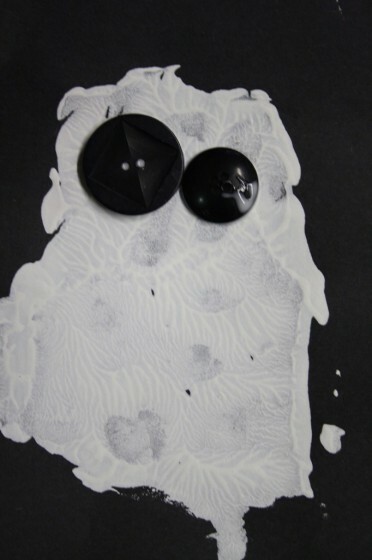 Experiment with print making, and create some spooky ghost prints. 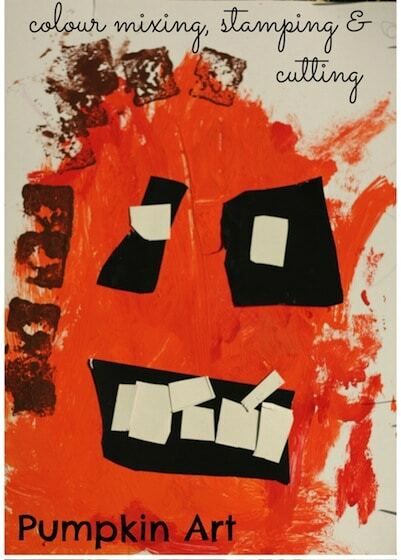 Painting, cutting, gluing, shapes and abstract art: These painted jack-o-lanterns cover it all. 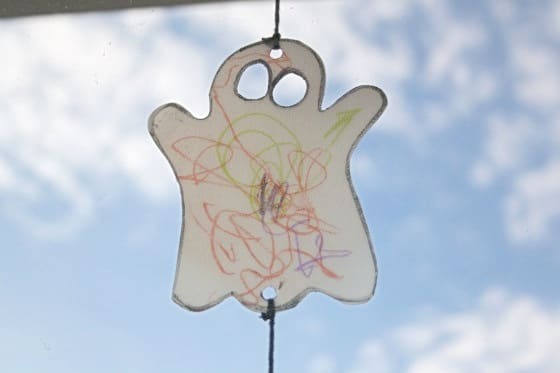 Milk jug sun catchers are so easy for toddlers to decorate the window with at Halloween. 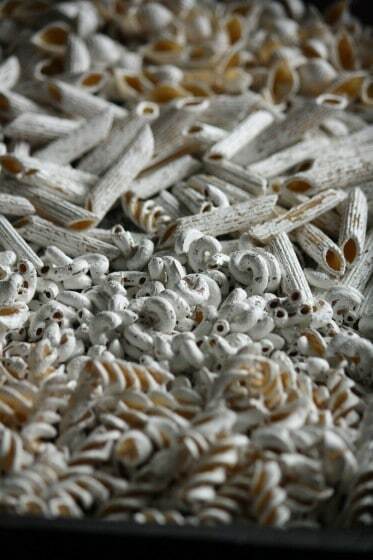 Turn some dry pasta into a pile of “bones” for a halloween wreath or in your spooky sensory bins! 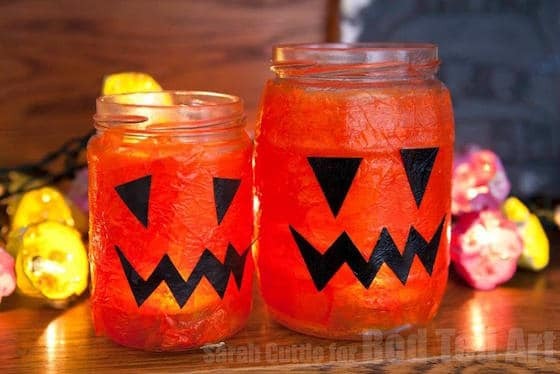 And here’s an extra that I’m adding in: check out these easy Halloween Lanterns by Red Ted Art. I love all of these, thanks for sharing!